IER - LISA 2 (8-10.04.2011) - Salon Philatélique de printemps - Angers 2011. 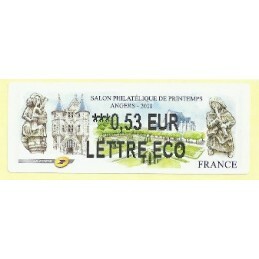 Mint ATM inland value (0,53 EUR LETTRE ECO). IER - LISA 2 (8-10.04.2011) - Salon Philatélique de printemps - Angers 2011. Mint ATM inland value (0,53 EUR). IER - LISA 2 (8-10.04.2011) - Salon Philatélique de printemps - Angers 2011. 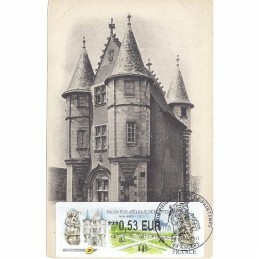 ATM inland value (0,53 EUR), first day postmark. IER - LISA 2 (8-10.04.2011) - Salon Philatélique de printemps - Angers 2011. 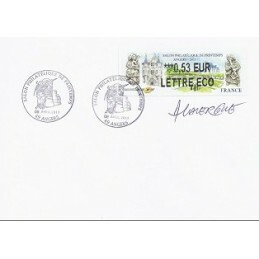 First day cover, with ATM (0,53 EUR LETTRE ECO). Signed by the ATM designer. 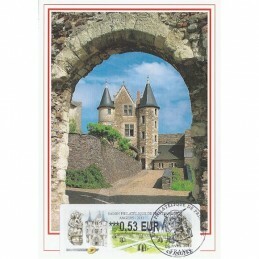 IER - LISA 2 (8-10.04.2011) - Salon Philatélique de printemps - Angers 2011. 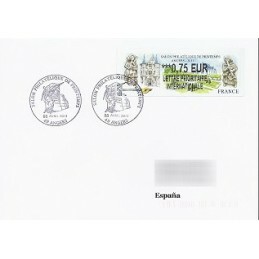 First day cover mailed to Spain (0,75 EUR LETTRE PRIORITAIRE INTERNATIONALE). 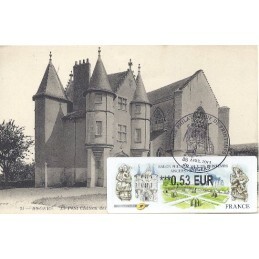 Postal indexation. IER - LISA 2 (8-10.04.2011) - Salon Philatélique de printemps - Angers 2011. 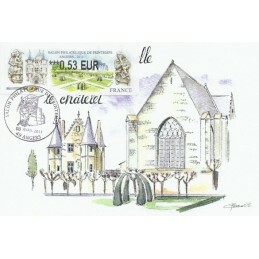 Maximum card with ATM (0,58 EUR LETTRE PRIORITAIRE) and first day commemorative postmark. IER - LISA 2 (8-10.04.2011) - Salon Philatélique de printemps - Angers 2011. 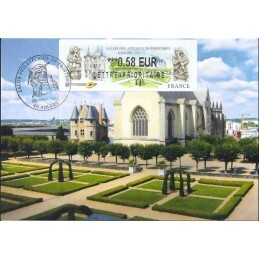 Maximum card with ATM (0,53 EUR) and first day commemorative postmark. IER - LISA 2 (8-10.04.2011) - Salon Philatélique de printemps - Angers 2011. 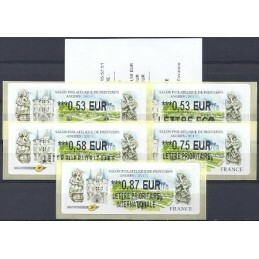 Mint set 5 values (0,53 - 0,53 LETTRE ECO - 0,58 LETTRE PRIORITAIRE - 0,75 LETTRE PRIORITAIRE INTERNATIONALE - 0,87 LETTRE PRIORITAIRE INTERNATIONALE) + first day receipt. IER - LISA 2 (8-10.04.2011) - Salon Philatélique de printemps - Angers 2011. 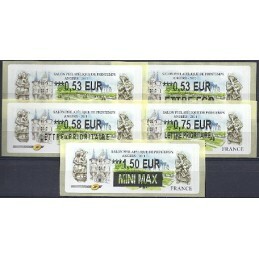 Mint set 5 values (0,53 - 0,53 LETTRE ECO - 0,58 LETTRE PRIORITAIRE - 0,75 LETTRE PRIORITAIRE INTERNATIONALE - 1,50 MINI MAX). IER - LISA 2 (8-10.04.2011) - Salon Philatélique de printemps - Angers 2011. 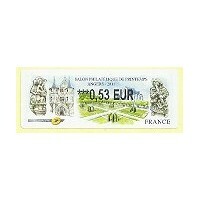 Mint ATM (2,00 EUR PETIT PAQUET PRIORITAIRE INTERNATIONAL). IER - LISA 2 (8-10.04.2011) - Salon Philatélique de printemps - Angers 2011. 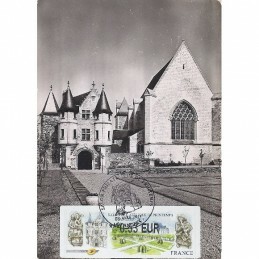 First day cover, with stamp (0,58 EUR) and ATM (0,53 EUR). 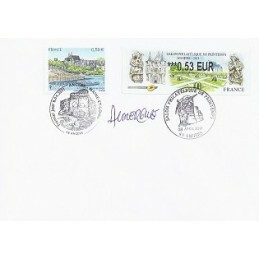 Signed by the stamp and ATM designer. IER - LISA 2 (8-10.04.2011) - Salon Philatélique de printemps - Angers 2011. 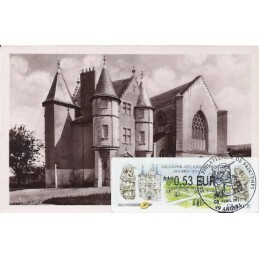 Maximum card with ATM (0,53 EUR) and first day commemorative postmark. Realized using a vintage postcard. IER - LISA 2 (8-10.04.2011) - Salon Philatélique de printemps - Angers 2011. 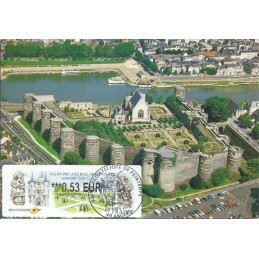 Maximum card with ATM (0,53 EUR) and first day commemorative postmark. Realized using a vintage postcard. (***) Only 3 pieces realized. IER - LISA 2 (8-10.04.2011) - Salon Philatélique de printemps - Angers 2011. 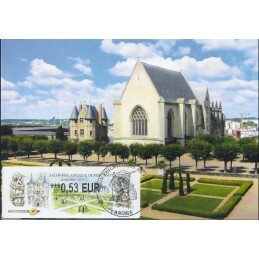 Maximum card with ATM (0,53 EUR) and first day commemorative postmark. Realized using a vintage postcard. (**) Only 2 pieces realized. IER - LISA 2 (8-10.04.2011) - Salon Philatélique de printemps - Angers 2011. 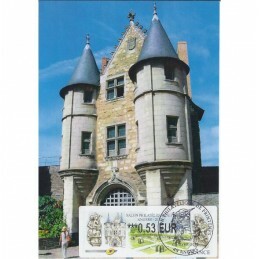 Maximum card with ATM (0,53 EUR) and first day commemorative postmark. Realized using a vintage postcard. (*) Unique piece realized. 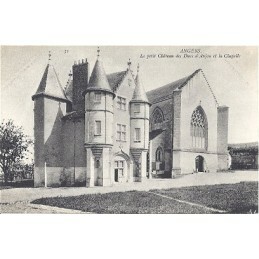 Vintage postcard, unused, see image. 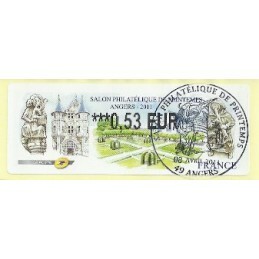 --- (8.04.2011) - Salon Philatélique de printemps - Angers 2011. 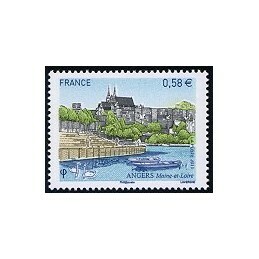 Mint stamp Angers (0,58 EUR).